We are honored to welcome you to Purpose Preparatory Academy Charter School. Purpose Prep is an academically challenging, disciplined, and joyful school in Nashville, TN. Unanimously authorized by the Metropolitan Board of Education, Purpose Prep opened its doors to an inaugural class of 90 Kindergarteners in fall 2013. We now educate kindergarten, first, and second grade scholars, and we will add a grade level every year thereafter to educate Kindergarten through fourth grade students by 2017. Purpose Prep is committed to being one of the best elementary public schools in our nation. We will achieve our mission by ensuring every scholar achieves the academic skills, knowledge, and ethical foundation that will set them on the path to college. We appreciate your interest in Purpose Prep. We know that our success as a school depends on the support of our families, friends, and supporters far and near. We have high expectations for the members of our community, and in turn, you can expect a lot from us. Purpose Prep upholds a high standard for excellence, and every school member understands and is driven by our mission. Our school model ensures an intensive focus on the acquisition of essential literacy skills, providing targeted and rigorous instruction in each core subject to meet the academic needs of every scholar. Purpose Prep holds scholars accountable for demonstrating excellent behavior by teaching them the character skills necessary for their success, specifically the school’s RISE with Purpose values – Purpose, Respect, Integrity, Self-Determination, and Excellence. By instilling in scholars a strong academic and character foundation that firmly underpins school and life success, Purpose Prep sets a foundation towards high levels of learning throughout middle and high school and on the road to college. On behalf of the founding team of Purpose Prep, we look forward to partnering with you and working together to ensure that the children of Nashville receive the excellent education they deserve to achieve their future goals and dreams. Thank you for your interest in Purpose Prep. Let us tell you more about why you should choose to enroll your child in our school. Purpose Prep holds high academic and behavioral expectations for every scholar. We believe that every child regardless of race, socioeconomic status, or incoming academic level can and must achieve at a high level. Every child is capable of achieving high behavioral and academic success. We model, teach, and hold all students to high expectations ensuring every child develops academic and character foundation to be set on the path to college. 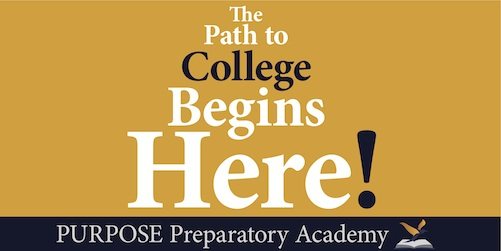 Purpose Prep is an academically rigorous, college-preparatory school. We are unapologetically focused on setting scholars on the path to college. Our classrooms maximize every learning second, and learning is academically rigorous, engaging, and fast-paced. Purpose Prep has an extended school day (7:50am-4:00pm) and longer school year (185 days). Scholars receive frequent homework and focused academic intervention. Purpose Prep has an intensive focus on literacy. To truly close the achievement gap, academic skill development - most particularly within literacy - is critical in the early grades. Our scholars engage in 225 minutes of literacy instruction daily. Our mission requires an impeccable academic foundation, most intensively within literacy, measurable at each grade level, and we devote the majority of our financial, temporal, and curricular resources towards that goal. Purpose Prep fosters a safe, disciplined, and respectful school community. Purpose Prep provides a safe and orderly environment where scholars maximize each and every learning opportunity offered within the school, and thus, are able to academically excel. With a clearly defined, firm, and consistent discipline policy and our RISE with Purpose Character Development Program, we hold scholars accountable for demonstrating excellent behavior. Our focus on positive character development provides scholars with the tools to practice, internalize, and exemplify these core values consistently in their daily interactions, in grade level appropriate ways. Purpose Prep develops strong partnerships with our families. Our families are equally invested in the success of our scholars. We detail the role and responsibilities that families must fulfill to support our shared work to set our scholars on a path to college. We are in constant, proactive communication, with daily communication on academic and behavioral progress, bi-weekly phone check-ins on scholar growth, three University Nights throughout the year on literacy and mathematics, and annual Home Visits and Family Orientation Sessions. Purpose Prep is free to attend, and there are no admission requirements. Any child living in Davidson County School District is eligible for enrollment. Through rigorous curriculum, high-quality instruction, and positive character development, Purpose Preparatory Academy Charter School ensures that all kindergarten through grade four students achieve the academic skills, knowledge, and ethical foundation to be set on the path to college. Purpose Prep provides an academically challenging, disciplined, and joyful elementary school to children of Nashville. With an intensive focus on the acquisition of essential literacy skills, Purpose Prep provides targeted and rigorous instruction in each core subject to meet the academic needs of every scholar. Purpose Prep holds scholars accountable for demonstrating excellent behavior by teaching them the character skills necessary for their success, specifically the school’s RISE with Purpose values – Purpose, Respect, Integrity, Self-Determination, and Excellence. “Intelligence plus character - that is the goal of true education. The complete education gives one not only power of concentration, but worthy objectives upon which to concentrate.” This statement by Martin Luther King, Jr. captures Purpose Prep's vision of education. We instill in Purpose Prep scholars a strong academic and character foundation that firmly underpins school and life success. We nurture intelligence, grow character, and set the objective high. Purpose Prep scholars read, write and speak at proficient and masterful levels in the elementary grades that set a foundation towards high levels of learning throughout middle and high school, and on the path to college. We welcome the heightened accountability required of a charter, and we drive all programmatic and administrative decisions to dramatically advance our mission. Our core values resonate in who we are, what we do, and the way we do it. In the truest sense of the phrase, we “RISE with Purpose” - Purpose, Respect, Integrity, Self-Determination, and Excellence. We are unwaveringly focused on achieving our mission - setting every Purpose Prep scholar on the path to college. Every action aligns with and contributes to our shared goals. We value and appreciate each other, as demonstrated through our words and actions. We treat others the way we want to be treated. Our actions are congruent with our beliefs and words. We always follow through on what we say we are going to do. We do whatever it takes to achieve our goals, exuding steadfast commitment and positivity in the face of challenges. We value the process, no matter how demanding, just as much as the outcome. We understand that we are what we repeatedly do - Excellence is not an act, but a habit. We distinguish ourselves by the way we consistently execute on the details.